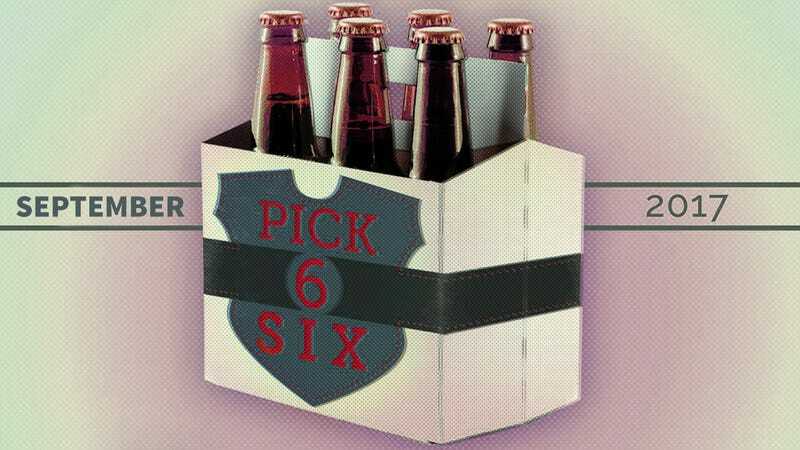 Pick Six is The A.V. Club’s monthly recommendations for the beers we’re currently digging. In the past few month, a beer-geeks-only debate has raged over what should be considered independent beer. With all the problems in the world, arguing about beer might seem frivolous. But for people who’ve bought into the craft beer revolution, this stuff is a serious matter. On one side you have drinkers who respect the Brewers Association as the arbiters of the industry, and follow their definition of “craft brewery”: Less than 25 percent ownership by a non-craft beverage company, less than six million barrels produced annually, and more beer than flavored malt beverage in a brewery’s total output. For this group, the “Independent Craft” seal—which nearly 2,000 breweries have pledged to affix on their label—can help guide their purchases. They see the brewing industry through David-and-Goliath-themed beer goggles: The ragtag “craft beer” army, the good guys, squaring off against the Big Beer behemoth. On the other side are those who think the Brewers Association ceded the moral high ground each time it has revise the requirements to be a “craft brewery.” These independence purists dig deeper into the operational reality of some of the Brewers Association’s most prominent members. Through their lens, brewers are disingenuous for taking on partial ownership or private equity investment while proudly promoting the “Independent Craft” seal. Beer writer Jason Notte brought up this cognitive dissonance by publishing a list of 15 “fake indie beers” on TheStreet.com in August, in which he called out Stone, Dogfish Head, and Brooklyn Brewery, among others. I don’t think he’s actually calling for a boycott, just pushing for what he sees as intellectual honesty. The tension between these two viewpoints illustrates the drastic changes the beer industry has gone through in the past few years. What once seemed a safe bet for double-digit growth year-over-year is now a much more risky investment. Many of the breweries on Notte’s list learned this the hard way, having taken on debt during the boom years that’s hard to pay back without the gangbuster growth once reliable in the craft beer industry. So when investors or a larger brewery offer to fix these financial troubles, it gets hard to say no. The chances of another hippy like Sierra Nevada founder Ken Grossman becoming a billionaire from a family-owned brewery are slim. The immediate future of beer in America is in small breweries with a hyperlocal focus. Where local laws allow it, self distribution and active taprooms can make tiny, smart operations add up to modest profits. States like Oregon already understand this. Cities like Chicago are starting to get a taste of it, too. I look forward to a future when every town has a great brewery. But even with more active breweries than any other time in the history of America, we’re a long ways off from that utopian vision. Fortunately until then we have regional and nationally distributed breweries filling in the gaps. They might not be perfectly ideologically pure, but I can live with that. After all, it is only beer. There are bigger problems to worry about. This Pennsylvanian craft beer trailblazer grew independently from 1996 until 2016 when it, along with New York’s Southern Tier Brewing Co, was acquired by private equity firm Ulysses Management. The new overlords appear to have been mostly hands-off thus far, as evidenced by the growth of its Blackboard series of experimental beers, which was launched just a month and a half before the sale. This entry was perfect for late-summer sweets appetites awakened by repeat visits to farmers markets. In fact, the sticky, sweet, overripe peach flavor of this beer was more satisfying than any peach fruit I ate all year. The second largest brewery in Indiana is still fully independent as of this writing. That’s impressive considering it now has six different locations spread across four different Hoosier towns (even if it was denied a new facility in Pawnee). Aside from TV cameos, Upland’s biggest claim to fame is its sour beer program, which requires an extensive lottery system to avoid angry beer geeks revolting. This offering is not one of those limited releases. Instead of the lengthy and unpredictable traditional souring process, Petal To The Kettle is a “kettle-soured beer,” meaning lactic acid bacteria starts souring the beer during the brewing process, which gets the beer out the door in a fraction of the time that a traditional mixed-fermentation sour beer requires. As sour beers have become more popular, more brewers began using this technique that was normally only used on Berliner weisse and gose. For the uninitiated beer consumer, the difference between these two types of sour beers may not be clear. An unscrupulous brewer could try to charge the same premium price for a kettle-soured beer that a competitor charges for the much more labor intensive traditional sour beers. Upland is doing the right thing here, by being upfront about the fact this beer was kettle-soured; it’s right there in the name, for Pete’s sake. The other part of that name, Petal, refers to the hibiscus and rose added, bringing a floral bitterness to the palate. This tiny independent brewery north of Chicago started shortly after head brewer Cesar Marron won the Samuel Adams LongShot American Homebrew Contest in 2013. Though known for brewing quality beers, Sketchbook didn’t really have a breakout brew that made them beer famous until earlier this summer when Draft magazine ranked its attempt at a NEIPA as the 19th best IPA sampled out of 386. I had it in the brewery’s taproom a few weeks before that and can concur, it’s a damn good IPA. Very aromatic with loads of juicy hop flavor and only the faintest whiff of bitterness in the finish, this one hits almost all the hallmarks of the New England IPA style. The one difference could be seen as a feature: Instead of sneaking in around 8 percent alcohol by volume (ABV) like many NEIPAs, Insufficient Clearance is sessionable at only 5 percent ABV. Since the Draft ranking published, this tropical treat is now available in cans. This 5-year-old independent brewery recently put a lot of time and effort into bottling many of its beers with nitro. Cashmere Hammer is such a pleasure to drink, it’s clear the work was worth it. The rich chocolate flavor hits you first, then you notice the creaminess almost like a milkshake. When you think it’s all done, you notice a slight earthiness and spice of rye malt—not overpowering, but hard to miss. When most stouts worth drinking are stuffed full of adjuncts, this straightforward approach is a welcome return to simplicity. The brewery that made contract brewing cool made a delicious line of Berliner weisse with different fruit added at Belgium’s De Proef brewery beginning last year. The raspberry variety was just what I wanted on a hot August afternoon watching the sunset turn the sky red until it matched the hue of the beer in my glass. As with all Mikkeller beers, half the reason for buying is the brilliant packaging. This one, with a minimalist reference to JFK’s slip of the tongue and repeating images of raspberries, cooly suggests a simpler time when it was mortifying that a U.S. president accidentally said he was a jelly doughnut. If all the other beers on my list this month are too fruity, hoppy, hazy, or dark, then this pick is for you. A classic German-style pilsner, the Trumer Brauerei has been operating in Austria for 100 years longer than pilsner has existed as a style of beer. In 2004, it opened a brewery in Berkeley, California to supply fresh pils to select American cities. The plan paid off. Now Trumer stands head and shoulders above the rest of the imported pilsners dotting liquor store shelves. And perhaps some credit for the recent resurgence of craft pilsners can be traced back to the true flavors of fresh pilsner making it to American drinkers on the regular thanks to Trumer Pils. The Gambrinus Company owns Trumer now, along with Shiner and BridgePort breweries. I write about beer for The Takeout.